The CityBench program has installed over 1,800 benches throughout the five boroughs and will install an additional 100 benches by 2019. To find a bench near you or request a bench in neighborhoods with a lack of seating, visit our Web Map here. See a list of our installed benches. The benches are for use by the general public and are not restricted to tenants of any particular building or patrons of any particular business. Benches cannot be used to displace street vendors. In all instances, an 8 feet clear path from bench to building line must be maintained. For benches with backs placed along the curb, the minimum sidewalk width is 12 feet from building to curb. For backless benches placed along the curb, the minimum sidewalk width is 14 feet from building to curb. For benches placed against a building, the minimum sidewalk width is 10 feet, six inches. Benches cannot be placed directly opposite a building entrance or cellar door. Where there is a sidewalk café, the sidewalk width is measured from the outside of the café to the curb. The minimum widths listed above apply in these cases. Benches cannot be installed on granite or bluestone in an historic district. DOT also will not install benches on distinctive paving without a third party, such as a Business Improvement District or property owner, having poured concrete footings per DOT specifications. For more information regarding the concrete footings, please email citybench@dot.nyc.gov. Backed benches are intended to be installed either at the curb and facing towards the buildings, or at the building line and facing towards the street. 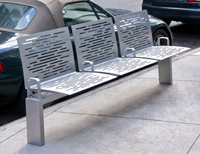 Backless benches are intended to be installed at bus stops or other locations where seated persons might wish to have the option of facing towards the buildings OR towards the street. When requesting a bench, you may indicate your preference for a backed bench or a backless bench. DOT covers the costs of installing and maintaining the bench. The CityBench program is funded through the Federal Transit Authority's (FTA) Section 5310 Program grant. The goal of the Section 5310 program is to improve mobility for seniors and individuals with disabilities throughout the country by removing barriers to transportation services and expanding the transportation mobility options available. If for some reason, such as construction activity or changes to bus stop locations, a bench needs to be removed or relocated, please email citybench@dot.nyc.gov or call 311. DOT will replace damaged benches. Property owners are responsible for keeping sidewalks around benches clean and cleared of snow as required by law. To report damage to a CityBench, please write to DOT. 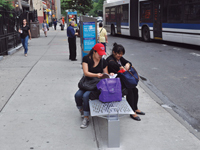 Photos of damaged benches can be emailed to citybench@dot.nyc.gov. e.g. "in front of Joe's Pharmacy"
If you have any questions, please contact citybench@dot.nyc.gov.